While keratoconus can happen at any stage of life, young people between the ages of 10 and 25 are most likely to develop this disorder. For individuals with keratoconus, their cornea, the clear layer in the front of your eye, gradually thins and begins to bulge outward. Keratoconus typically causes nearsightedness and astigmatism in both eyes. The first signs of keratoconus are rapid changes in vision that require frequent adjusting of prescription lenses. Other symptoms include increased sensitivity to light, eyes strain and irritation, halos around lights at night, headaches and an incessant urge to rub your eyes. Eventually, the corneas become noticeably cone shaped. Keratoconus is the most common type of corneal dystrophy, or degenerative corneal disorder. It affects one in every 2,000 Americans, according to the National Eye Institute. Many symptoms of keratoconus are similar to those of other corneal disorders, especially during the onset of the condition. This makes keratoconus difficult to diagnose. 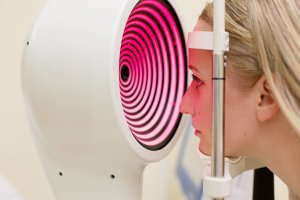 Nonetheless, to diagnose keratoconus, ophthalmologists use a slit lamp to inspect your cornea at the microscopic level. Telltale signs of keratoconus include corneal thinning, an iron-colored ring around the cone-shaped cornea, stress lines and scarring at the top of the cone. Your eye doctor will also use instruments and lights to measure the curvature of your cornea. Researchers are not exactly sure why some people develop keratoconus. Leading theories center on genetics, environment and hormones. Some scientists have noted a slightly higher chance of developing keratoconus if a family member has it, but this correlation has not been proven with absolute certainty. Possible environmental causes include allergies that lead to excessive eye rubbing or poorly fitted contact lenses. Some researchers hypothesize that keratoconus is related to the endocrine system (the collection of glands that secrete certain hormones), because the onset often happens at puberty and worsens during pregnancy. Corneal Crosslinking. Healthy corneas keep their shape because cross-linked collagen fibers serve as supports. Corneal collagen cross-linking (CXL) involves saturating the cornea with riboflavin drops and activating them with an ultraviolet light. This strengthens the cornea by increasing the amount of collagen cross-linking. While CXL doesn’t cure keratoconus, it can arrest the progress of the disorder. Intacs Surgery. Your eye doctor may suggest inserting Intacs, extremely thin plastic semi-circles. These flatten the cornea, improving vision. You may or may not still need to wear prescription lenses after Intacs surgery. Corneal transplant. If keratoconus progresses until the cornea is too thin or scarred to tolerate contacts, your ophthalmologist may recommend a corneal transplant. According to the National Eye Institute, this operation is successful in more than 90 percent of those suffering from advanced keratoconus. If you are experiencing signs of keratoconus, call us so we can diagnose your vision condition and suggest an appropriate plan of action for your visual needs.